High-quality pillows can cost a pretty penny, but there are also some surprisingly great pillows out there that cost next to nothing. 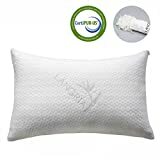 A perfect example is Amazon’s current sale that’s running on the LANGRIA Luxury Bamboo Shredded Memory Foam Pillow, an adjustable loft pillow that combines comfort with a hypoallergenic filling that anyone can enjoy. This pillow is a great value at $27, but the coupon code 6CCQ72PC drops the price all the way down to just $16.19.